Margaret armstrong's "field book of western wild flowers"
Written in England in 1855 by the English writer and historian Charles Kingsley, this observation could also have applied to the growing interest in nature that would soon take hold in America. One of the first publications for amateur naturalists in the U.S. was How to Know the Wildflowers: a guide to the names, haunts, and habits of our common wild flowers . Published in 1893 by Frances Theodora Parsons (under the pen name of Mrs. William Starr Dana), this very successful guide was followed three years later by Parsons’s How to Know the Ferns . The illustrator for these guides was Marion Satterlee whose excellent line drawings fulfill the basic requirement for illustrating a field guide—clear and concise drawings that can be seen easily in a small format and that convey the identifying characteristics of the plant. The publication of field guides proliferated on the East Coast and soon followed the western expansion of the country as travelers and settlers became interested in the vast botanical wealth that they encountered. Guides to Colorado’s wildflowers were the first to be published, then books for California and the Rocky Mountains. What was lacking at the turn of the century was a guide that would serve to identify wildflowers for the entire western region. The first book to do this was published in 1915. 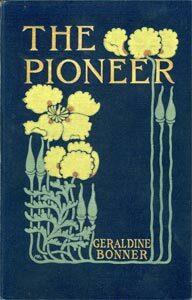 Field Book of Western Wild Flowers was written and illustrated by Margaret Armstrong (1867-1944) who had no formal training in either botany or art. In spite of her lack of formal art studies, Armstrong became one of America’s foremost designers of the ornate book covers that were in vogue at the turn of the century. 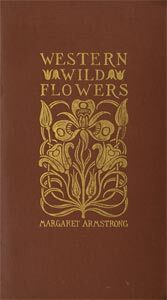 In 1890, Armstrong began designing covers in her distinctive Art Nouveau style with an emphasis on nature motifs. By 1910, the dust-jacket had replaced these beautiful covers, and Armstrong went on to other pursuits. While traveling in the West, Armstrong found the existing regional wildflower guides to be inadequate and decided to write one herself that would encompass the entire West. 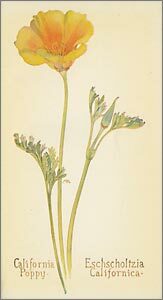 With Professor John James Thornber of the University of Arizona serving as botanical advisor, Armstrong wrote the text and prepared all of the illustrations in a relatively short amount of time. All of the illustrations were drawn from live specimens—a total of 48 watercolors and 500 line drawings—all produced between 1911 and 1915. 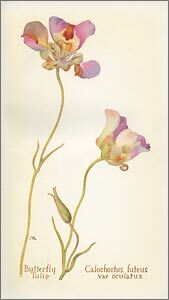 Even in the midst of today’s abundance of wildflower guides, Armstrong’s work is worth seeking out, for both her unique artwork and perspective. This appeared in the June 2016 issue of The Desert Breeze, the monthly newsletter of the Tucson Cactus and Succulent Society.